still as the always-falling, ever-new flakes of snow. A wolf? A coyote? A dog? 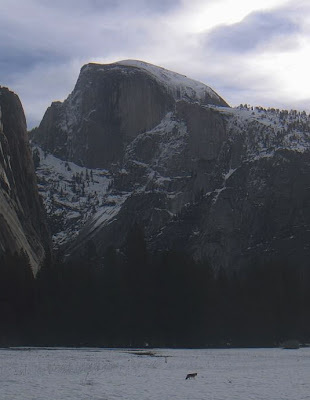 From one of the Yosemite webcams on December 25, 2010. Looking forward to another fruitful year of reading your blogs and blogging! Here is where I started in 2006. My 4th blog birthday was December 8. P.S. At the top of this post is "Boy with Amaryllis and Orion," one of my trackpad drawings from January 2008. Looking forward to keeping in touch in 2011. Great to see you back, am, and what a great poem for your blog. Good to see you back. And a Happy New Year! Happy New Year to you, am. Wonderful poem, art, and photo. You make me want to check in on the Yosemite webcam. A wonderful shot. Hello am! So good to visit your blog and see your collections and reflections. Happy blog anniversary! Thanks so much for the welcome back. It's good to be back in the community of bloggers with my writing voice. I didn't go anywhere and, as you know, I did keep reading your blogs. I found it very difficult not to comment when moved to comment. Several times I was startled to find myself writing and then stopped. I really did need time away from writing, but I sure did miss it and appreciate it all the more now. Your blogs (and kjm's comments) inspire me and keep me blogging and in touch with people near and far. New Morning Koan / What would you say to Dr. Bob?